Stanghellini, an Italian psychiatrist, aims to take the reader into the world of schizophrenics and manic-depressives. His approach is, broadly, phenomenological. He aims to comprehend the life-world and illuminate the subjective experiences of sufferers from psychopathology. Perhaps inevitably, given that this is his goal, he has written a difficult and allusive book. Those who want an explanation of schizophrenia, or a guide to its treatment, should look elsewhere. This is a book which seeks to communicate the experience of the sufferer, not, primarily at least, to explain it. Schizophrenia is a disorder of common sense, Stanghellini argues. Common sense has two meanings; it refers both to the set of taken-for-granted rules and tacit understandings by and through which each of us grasps the social and natural world, and also the cross-modal sharing and binding of the reports of the senses. Stanghellini argues that these two meanings are related, and that both are disrupted in schizophrenia. The idea seems to be this: Schizophrenics, as it is now widely recognized, seem to suffer from some kind of deficit in action and thought monitoring. Hence their susceptibility to passivity experiences and to delusions of control and thought insertion: they think and act in the normal way, but because they fail to experience their thoughts as caused by themselves, they attribute them to someone or something else. As a consequence of their deficits in sensation, Stanghellini seems to suggest, schizophrenics suffer from a deficit in theory of mind. Since they cannot monitor their own mental states effectively, they have great difficulty in simulating the mental states of others. Without this ability, schizophrenics are at a loss to decode the 'rules' of the social game. If this story is on the right track, schizophrenics difficulty in attributing the outputs of their senses to themselves is causally responsible for their difficulty in understanding the social world, and the two senses of 'common sense' are indissolubly linked. The problem with this account, which I have attempted to reconstruct from Stanghellini's allusive and difficult prose, is that it is straining somewhat to call the difficulty schizophrenics have in monitoring their own thoughts and actions a problem of common sense. Granted it might have sensory consequences, but it is equally, and perhaps even basically, a difficulty with monitoring thoughts and intentions, not the outputs of the senses. Moreover, a parsimonious explanation of schizophrenia will account for all the difficulties encountered by sufferers, and it seems that this explanation fails this test. Rather than accounting separately for schizophrenics' difficulties with the social world and their difficulties with language, for instance, we should a unified explanation of both. Perhaps, however, this objection misses the point. 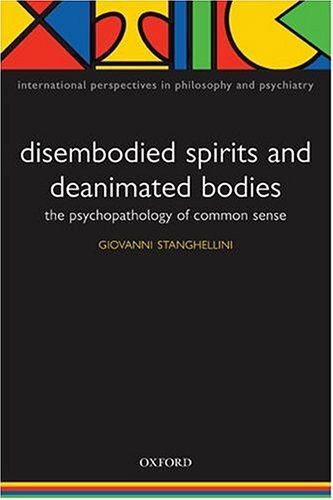 Perhaps Stanghellini does not aim to explain schizophrenia at all, even when he offers an account of it. Instead, perhaps the account itself is in the service of the overall goal of communicating to us the experience of schizophrenia. This suggestion makes sense of a number of otherwise puzzling features of his work, such as the constant references to works of art, and especially to the paintings of René Magritte (at one point, Stanghellini even suggests reading his work with a volume of Magritte paintings in hand). Perhaps he believes that the comparisons, metaphors and accounts he offers of schizophrenic delusions and hallucinations will prove a better guide to the experience of sufferers than will rivals, regardless of whether they are true. If this is its goal, does it succeed? That is a question that only present or former sufferers from schizophrenia, their close family and the clinicians who treat them are well placed to answer. However, it is worth recording here one strange feature of about Stanghellini's approach. Despite avowed commitment to a phenomenological methodology, the schizophrenic and other sufferers from psychopathologies remain largely offstage. With the exception of a brief prologue, which purports to present the voice of a patient (though the writing is so self-consciously literary that I have no doubt that the voice has been carefully edited and reworked; indeed, I suspect that the patient is actually an ideal-type, not an individual), we barely encounter a schizophrenic. Phenomenology is supposed to return us to "the things themselves", but in Stanghellini's hands it is largely a theory-driven enterprise. It is art and philosophy which gives us privileged insight into the world of the schizophrenic, not the words and deeds of sufferers themselves.